A few days back something happened. Even as I recollect it to pen it down, it gives me the chills and at the same time praise God for His presence that constantly surrounds us. It was pretty late in the afternoon. LO was hungry. I grabbed her in one arm, carried her and headed to the kitchen to get her lunch. 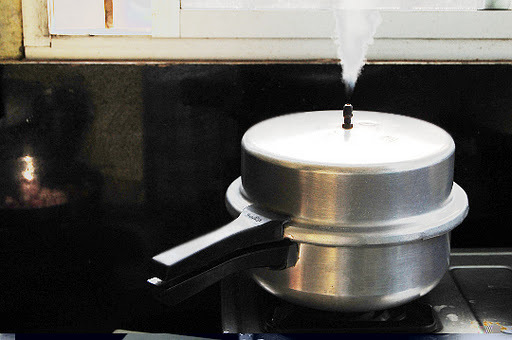 The pressure cooker that contained the rice was on the stove with its whistle on. I shook the whistle to see if the pressure had escaped. It appeared so as the whistle came off with my hands in ease. I held the cooker handle and tried opening it. It simply refused to open. I kept trying harder (with LO still in my arms) subconsciously knowing something was wrong and I shouldn’t try further. Stupid me, kept trying much harder with greater force and… BOOOOOOM – the lid burst open with steaming hot rice all over LO and me. A little extra pressure inside the cooker could have turned this into a major accident. Thankfully, the cooker did not explode and its lid was still in my hands. Poor LO cried in shock for a few minutes and then cooled down. Either of us didn’t suffer burns from the hot rice. The incident did not affect me until evening. But as my brain started replaying it over and over and as my mind processed what had happened, I shook in fear. I just couldn’t imagine what my stupidity and carelessness could have cost. When this incident occurred, my parents were very much at home and LO was where I thought was the safest place – my arms. But all of us were helpless. It was clearly obvious that it was only the mighty hand of God that protected us! I just can’t stop praising Him for the way He cares and protects us from time to time! and the mountains fall into the heart of the sea!